Wally is only 10 months old, but the goldendoodle pup is helping Fairfax County firefighters through the stress that comes with witnessing tragedy. WASHINGTON — If you ever have the opportunity to stop by Fairfax County Fire Station 32, Fairview, you might be greeted by their newest resident — and boy, is he cute! 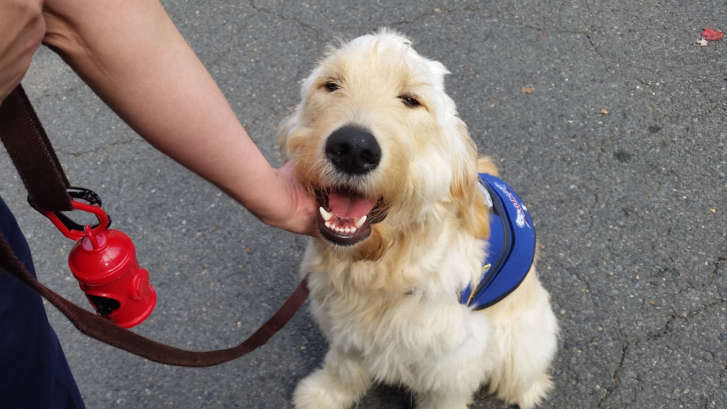 Wally is a 10-month-old goldendoodle and aside from his incredible cuteness, Wally offers emotional support to firefighters as a therapy dog, not a mascot. He met his new firefighting family on Oct. 12 and was donated by Caring Angels Therapy Dogs, an organization that supplies trained service dogs for veterans who are suffering from mental health issues, such as PTSD. The hope of this pilot program is that Wally will help firefighters deal with the daily stress of witnessing trauma and tragedy as part of their jobs. Bailey is one of several people who pushed for the pilot program. “This is probably one of the only dogs in the Metropolitan area that lives at a fire station 24/7, 365 days a year,” he said. There are three shifts at the firehouse, during which Wally has designated trained handlers who care for him. “When he’s in his vest, he knows he’s working,” said Lt. Katja Lancing, one of Wally’s handlers. She says she was working with Captain Buck Best in the fire department’s Behavioral Health Office about a year ago and that he was really supportive in getting a therapy dog at the station. She says Best is working to raise awareness about mental health and to get rid of the stigma attached to mental health issues. Fire station 32 Commander Captain II Daniel Borden said Wally is a pleasure to be around. Borden is one of Wally’s play buddies, since it’s still important for Wally to be a puppy. “First, I wasn’t sure the program was going to happen [because of] a liability in the county, being concerned about a dog being in a fire house and the possibility of [it] biting someone. And then they assured us through the training that it wasn’t going to happen,” Borden said. He added that Wally helps take the tension out of the day, especially when firefighters have down time, helping break up the monotony. As commander of the station, it was Borden’s call on whether or not to go ahead with the program. “If the pilot program works out well, they’re going to try and help us to see if they can provide us more dogs … to put in other stations here in Fairfax County,” Bailey said. The program is in partnership with master certified dog trainer with Sonny Madsen, who owns “Sit Means Sit” dog training in Northern Virginia. Madsen says Wally and his brother Brooks were donated to Caring Angels by a breeder in White Post, Virginia (Hidden Mystery Farms) to be service or therapy dogs. She says from day one she knew Wally would be great for the job. “Wally has a natural affinity for people who are sad and seems to have an old soul,” she said.